Luxury 3-Bedroom, 2-Bathroom Villa Within 15 Minutes Drive Of Disney. Availability!!! SALE Limited time offer! Hot Off The Press - Special Offer - 25% OFF All Availability!!! SALE Limited time offer! See our 5* rating customer reviews on this website!!! SALE Special Offer - Book more than a year in advance and receive a massive 30% discount on published rates. 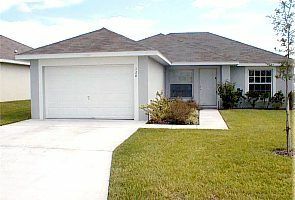 The Pines is a luxury 3-bedroom, 2-bathroom villa close to Disney and all other Orlando attractions. Hot Off The Press - Special Offer - 25% OFF All Availability!!! Limited time offer! Hot Off The Press - Special Offer - 25% OFF All Availability!!! SALE - Limited time offer! Disney is only 8 miles away, that's only a 15 minute drive. Universal Studios, Islands of Adventure and Seaworld are all within half an hours drive. The Pines is on the right side of Orlando for quick and easy access to Busch Gardens, Clearwater & St. Pete's Beach. There is a new Publix supermarket less than 2 minutes drive away and a new Super Wal*Mart (shoppers paradise) a few miles further up Highway 27. There is a good and varied selection of restaurants and other shops a short distance from The Pines on the US27. It takes about 2 minutes to drive to a good and cheap Chinese or Pizza take-away or ring, from The Pines, for Free delivery! The nearest Publix (like TESCO) is 1 mile away, 24 hr. Wal*Mart is 5-miles away. The Pines has everything you could want to make your visit truly relaxing. Read our past guest comments to see the 100% very high praise posted. You can dip in and out of the solar heated private 24ft by 12ft pool at your leisure. The FREE solar pool heating raises the temperature of the pool to, typically, a warm 85 degrees in summer. To help you keep in touch, if you want to, you can take advantage of FREE Wi-Fi Internet access and phone calls within the US and to Canada are also FREE. Cook-in using the top of the range microwave oven or the self cleaning oven (range) and hob or dial for a free delivery pizza or Chinese. Maybe you want to eat out. There is a massive selection of restaurants, only a short drive away, to meet all tastes. We offer you the use of The Pines safe, cot (Crib) and infants high-chair free of charge. We also offer a late departure on your last day, when possible, free of charge. Others charge extra for these services!!! With the provision of Free Solar Pool Heating, Free Wi-Fi Internet Access and Free Phone Calls renting our villa makes economic sense ... helping to make your money go further. The Pines is in an excellent location away from the hustle and bustle yet within easy access of all of the entertainment that Orlando has to offer. OUR CHARTER - We aim to provide a top quality service and value for money to our customers. The aim being to entice you to come back time and time again to our luxury villa, The Pines. When you send an enquiry email you can expect a prompt response, often within the hour wherever possible. We employ a professional management company, FrontLine Florida, to ensure a comfortable stay. We keep our prices very reasonable so that our customers will know that they are getting value for money with quality. SUMMARY - Free Pool Heating, Free Wi-Fi, Free Phone calls, Free cot, high-chair, security safe and a late check-out (when possible) PLUS always very reasonable prices. There are 2 dining tables - one in the kitchen and the other in the dining room both seating up to 6 people. In a modern and quiet development of mixed-type detached rental properties yet within easy and quick access to all of the entertainment that Orlando has to offer. Ideally located, The Pines is on the West side of Kissimmee and can found by travelling West on the 192 to the very end and then South on US27. Easy access to Clearwater, Tampa, Busch Gardens, Sea World, Disney, EPCOT, Magic Kingdom, Animal Kingdom, MGM Studios, Universal Studios, Universal Island of Adventure, Cape Kennedy, NASA and Cape Canaveral. Golf: The home is approximately 3 miles from the recently established Champions Gate Greg Norman golf course, Highland Reserve is just up the road and Southern Dunes is approximately 15 minutes drive away. There are approximately 10 first class courses within a short drive.